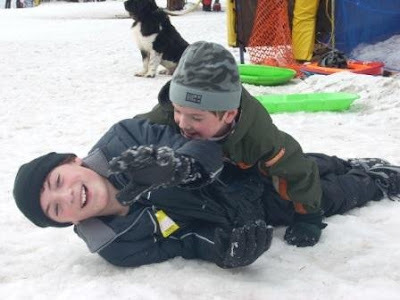 Ah, the lure of the snow on a three-day weekend. Thanks to that teacher work day -- again, do the teachers not work during school days? 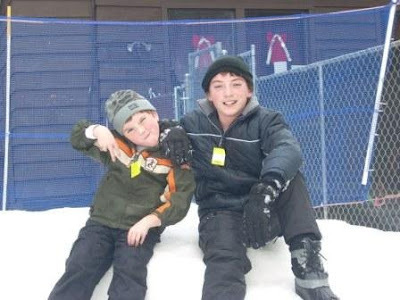 -- we drove up to Reno and Tahoe for sledding, skiing and skating. The kids had a blast. Eldest learned to ski and can't wait to go again. They all went sledding. 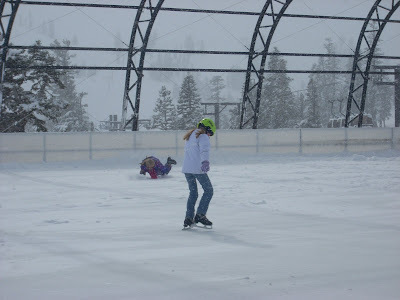 And Daughter got to skate on the outdoor rink at Squaw Valley in the middle of a blizzard. Hard as they tried to keep the plowing on pace with the snowing, they never managed to stay ahead. Youngest groaned and moaned the entire ski/skate day, so he just made my day fun, fun, fun. I just turned up the mp3 player and pretended I was in a whinge-free zone. Looks like y'all had a fun time - or at least that the music was cranked up enough for you to enjoy yourself. Is youngest sick? What's the moaning about? That looks like so much fun! I wish we could do something like that - and then come back home where it's warm (altho it's not too warm right now - temps in the 40's all day today, and maybe 50's tomorrow, but a light freeze overnight - I've got the heat cranked up! ).